Goodreads description--Focus on the things that bring you joy with 100 Days of Thanks. Short inspirational readings, space to record your thoughts, and brief Scripture references in a high-designed four-color gift book will help you find a peaceful, happier life. I love my sleep. I used to go to bed at 9 pm in high school voluntarily because I love getting a good night sleep. Now I don't oversleep. I'm up by 7 am at the latest since becoming a mother, but frequently awake by 8 am before then. BUT I found myself with a newborn. One who had a lot of gas and acid reflux and was awake FREQUENTLY during the night. Lack of sleep can affect so much. And even though I knew I had so much to be thankful for. My brand new beautiful blessing. My family. Health. A roof over our heads. Being able to be a stay at home mom. I found myself struggling with my attitude. Mostly due to sleep deprivation. But even sleep deprived, I found myself letting the littlest things steal my joy. I knew that I needed an attitude change. And I saw 100 Days of Thanks available for review. I jumped at the opportunity to read and review this book. I thought I'd take this book slowly. One day at a time as it is designed. Take notes. Write my thoughts and some prayers based off the prompts at the end of each day's devotional. However, because I was given an Adode Digital Editions version for review, I only had 30 days to read 100 Days of Thanks. I'm not complaining. There were plenty of days that the devotion was short that doing a week's worth in one day wasn't too major of a task for me. And the deadline actually forced me into a great sense of thankfulness and gratitude quicker than had I been doing each devotional one day at a time. Either way, I think this is a great source to focus your thoughts in a more positive and thankful direction. And this turned out to be exactly what I needed to get my head in the right place (focused on God and all I have to be thankful for versus simply being focused on a lack of sleep). As I said, most of the devotions are fairly short. Most frequently, they take up a page. Often only a paragraph or two. And only occasionally they go two or up to three pages long. This is a daily devotional where time to get it done each day should NOT be an issue. The topics were well thought out. Some very basic and some more complex. I did take notes which I think helped the information sink in and me make things more personal and applicable. The biggest thing that 100 Days of Thanks did for me was remind me of what once used to be one of my favorite Scripture (in truth it still is) that I'd forgotten: Philippians 4:8 (NKJV) Finally, brethren, whatever things are noble, whatever things are just, whatever things are pure, whatever things are lovely, whatever things are of good report, if there is any virtue and if there is anything praiseworthy--meditate on these things. Stormie Omartian says in The Power of a Praying Woman that if I'm spending my time meditating on these good things then I don't have space for negative things to enter my mind or to come out of my mouth. And 100 Days of Thanks reminded me of that. While there's only so much I can do to affect how much sleep I'm getting due to having a young baby that isn't quite sleeping through the night (although he's much much better at the time of this writing and probably sleeping through the night at the time of posting this review) I can and do have control over what I think about and what comes out of my mouth. I don't have anything at all negative to say about 100 Days of Thanks. It did the job I needed it to do. It got my head and heart focused in the right direction. I also can't say that I was blown away--in that I had no new revelations or a deeper understanding of the Scripture. I don't think that was necessarily the purpose of this devotional. But that keeps me from giving it 5 Stars. I did love the photography included. It gave me a nice visual to keep in mind the beauty of God's creation which in and of itself is no small thing to be thankful for. 100 Days of Thanks gets 4 Stars. 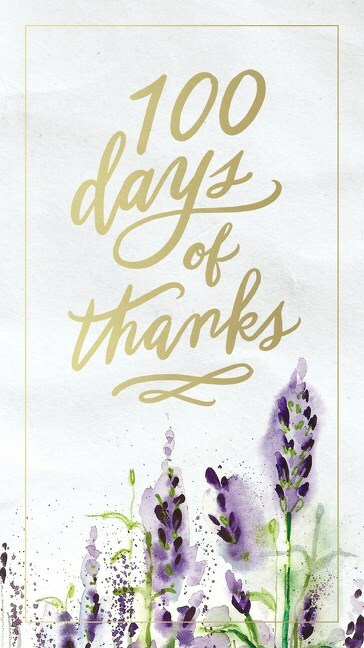 Have you read 100 Days of Thanks? What did you think? Let me know!